Special Force to combat terror | Daily Express Online, Sabah, Malaysia. Kuala Lumpur: The establishment of the National Special Operations Force (NSOF) as the first responder to threats of terrorism, proved that the Government is taking such threats seriously.Prime Minister Datuk Seri Najib Tun Razak said the team, comprising 17 officers and 170 personnel from the Malaysian Armed Forces (ATM), Royal Malaysian Police (PDRM) and Malaysian Maritime Enforcement Agency (MMEA), was ready to be mobilised at any time. "Previously, when something happens, we don't know whether to send the police or army to deal with it, so with the NSOF, it will become the first team to respond. 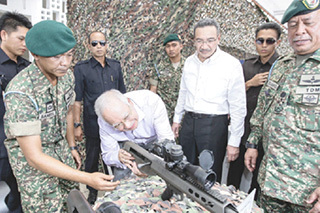 "When facing a threat, the Armed Forces Chief and Inspector-General of Police will assess the threat before sending a report to the Prime Minister before any action can be taken, in line with the National Security Council Act," he told a press conference after launching the NSOF team at the Sungai Besi Camp, here, Thursday. Also present were Defence Minister Datuk Seri Hishammuddin Tun Hussein, Minister in the Prime Minister's Department Datuk Seri Shahidan Kassim, Attorney-General Tan Sri Mohamad Apandi Ali and Armed Forces Chief Gen Tan Sri Zulkifeli Mohd Zin. Najib said the team was undergoing training at the Sungai Besi camp. "I was told that this is a task force of various agencies (namely) the ATM, police, and MMEA. It is the first of its kind in the world being set up by a government," he said. The Prime Minister said the team had began training together for the past six months but had yet to be involved in any operation. Earlier in his speech, Najib said the Government took the global terrorism incidents seriously, especially involving Daesh militants such as in Syria, Iraq and Afghanistan. "To date, a total of 250 Malaysians who are involved with Daesh militants, have been detained in the country, 32 people have died in Iraq and Syria while more than 60 people are still fighting for the retrograde ideology," he said. Najib said the development of social media had influenced the society on Daesh militant group ideology, for example the attack on Movida nightclub in Puchong last June. "Fortunately, no fatal casualties, only eight were injured. Are we sure this thing will not recur. With the establishment of NSOF, it will improve our preparedness, and our ability to eradicate any incidents at any time," he said. The application for new staffing will be made once the team starts to operate and for a start, all of the NSOF personnel are on secondment from the three agencies. At the event, Najib also approved an allocation of RM200,000 to improve the infrastructure for the NSOF team at the camp. Meanwhile, a Ministry of Defence statement said the NSOF operations depend on the types of threats against the interests and security of the country. "NSOF acts as a quick reaction force to curb terrorism in the early stages. The land, air and maritime units will be mobilised as the early group and will confront, fight and eliminate the threats. "The support group will help if needed. Once the threat has been eliminated, NSOF will hand over the operation to security forces," said the statement. New posts will be created once the team starts to operate. For a start, all NSOF personnel are seconded from the ATM, PDRM and MMEA. The first group will serve for at least three years while the next group will serve for at least two years. The main task of NSOF is to eliminate all forms of terrorism on land, air or in the water and to be always prepared to react quickly against threats. Team members will continue Force Integration Training (FIT) to enhance their skills to deal with critical situations and prepare contingency plans for threats to national security and perform other duties as directed.